The Porch - All Things Pearl Jam: Could Maroon 5 singer Adam Levine fill in at drums for Pearl Jam? Could Maroon 5 singer Adam Levine fill in at drums for Pearl Jam? Star of the The Voice and Maroon 5 singer Adam Levine tweeted that he would be willing to fill in for Pearl Jam drummer Matt Cameron if the band would have him. Cameron, drummer for both Pearl Jam and Soundgarden, has been a busy man in 2012. He completed a European tour involving both bands and never missed a date! Eddie Vedder was quoted as calling him the busiest man in the music business. Currently, Pearl Jam has no scheduled tour dates in the US for 2013 but they are working on a new album. Soundgarden just released King Animal and is busy re-energizing their fan base after more than a decade of being broken up. This puts Matt Cameron in the hot seat as both bands are once again in the spotlight. "If Pearl Jam needs a temp drummer while Matt Cameron tours with Soundgarden, I've been practicing to your records since I was 11. I'm READY." "1. I'm dead serious. 2. I'm DEAD serious." 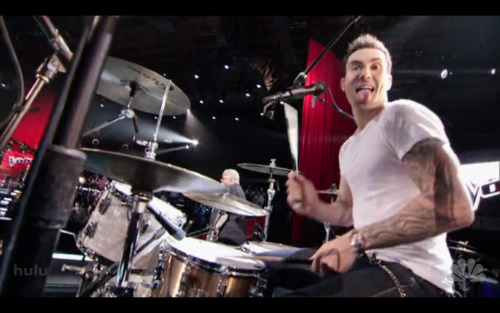 Do you think Adam Levine would make a good fill in? What's next, the guy from Nickelback?!?! Say it ain't so! I do not begrudge Mr. Levine his success with his craptastic group and I have actually come to like him after experiencing his personality on The Voice. I used to think he was a huge douche along the likes of Tony Romo or Tom Brady....I now accept him as a fairly decent human though I did enjoy seeing him get his arm ripped off on American Horror Story. Despite my acceptance, I cannot in any way fathom what would be a gross violation of all that is good and holy if he were to play drums for Pearl Jam. This is an idea that needs to be shut down with haste and erased from all memory. Dear Adam, I would not come in to your church and pretend to know how to pray...so don't come in to mine and pretend you know what a real band is or what actual music sounds like. That is all. I could not have said the previous statement better. The ONLY good that would come out of this is no more Maroon5. Actually I know all the lyrics to Pearl Jam songs so if Eddie needs a break I could fill in..of course I'm no Maroon 5,I'm just a MA-roon for thinkin that's how it works! Right on from the above rant! I say simply OH HOLY NO.